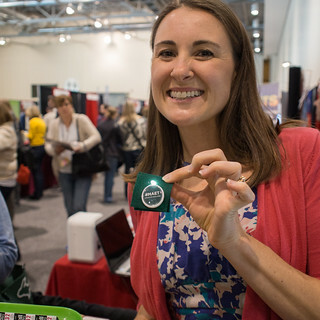 At the Master’s in Educational Technology Booth at the MACUL14 conference, we created a mini Maker Faire, inspired by the larger maker movement that challenges us, as a program, to imagine technology integration in creative, authentic and meaningful ways. As a program, we embrace the idea of creating, not just consuming and encourage our students to think of ways to repurpose the world around them for their curricular and pedagogical goals. We have purposefully integrated the maker mindset into one of our classes — CEP 811 — and today, we discovered that MACUL attendees LOVE to make things. Over 160 teachers and technology integration professionals joined the maker magic! We featured two “maker” activities today, a simple paper-based circuit and a more complex sewn circuit. Below, we’ve included lists of materials, estimated costs, and recommended how-to information for both of these activities. We have also embedded .pdfs below that highlight curricular connections to electrical circuits for content-area teachers who would not typically integrate electrical circuits into their curriculum — English Language Arts, History/Social Studies, and Visual Arts. We’ve also written a set of curricular connections for teachers of ANY discipline. In this activity, MACUL participants added an LED light to their conference name tag. Decide where you would like to place the light for meaningful effect. Do you want to light up the “i” in your name on your name badge? The “M” in MACUL? Punch a hole in that place with the paper punch. Plan out your circuit. Based on where the light will go, decide where to place the battery and how long your copper tape will need to be. For this project, most people cut a length that is about 10 cm or 5 inches. Cut the adhesive copper tape in half, lengthwise. You’ll need two skinny strips of copper tape, placed very closely together to make the circuit work. Plan the placement of the two pieces of tape on your name badge so that the LED light, which you will place between the two strips, will shine through the hole you punched in the paper. Generally, this means that you have to place each piece of copper tape so that it partially covers the hole you’ve cut and that the end of the tape strip adheres to the paper beyond on both sides of the punched hole. To make the circuit, stick down the first length of copper tape. Lay the coin battery on top of the tape, positive side up. Position the other piece of tape so it connects with the positive side of the battery (the top). Stick this second piece of tape down on the paper so that it runs parallel to the first but so that there is a 1 mm space between them. Use Scotch tape to fasten the battery to your name badge. Place the LED light across the copper strips so that each teeny diode of light touches one copper strip. Test the circuit by pressing the LED against the strips of copper tape with the tweezers. Does it light up? If not, flip the diodes. Stick the LED light down onto the copper tape using the double-sized Scotch. Voilà! You have a paper circuit and a very fancy MACUL name badge! Be sure you have a good connection between the battery and the copper tape. Stick it down with scotch tape — a couple of pieces might be required. Be sure the strips of copper tape do not touch. This will short out the circuit. Be sure the LED light is positioned properly. There are positive and negative diodes on the light — you have to position the LED so that the electrons will flow! Flip the LED light around if it doesn’t work at first. Be sure the light is securely connected to the copper tape. You might need a few pieces of tape to do the trick. 1. Put the battery in the battery holder. The “plus” side should be facing up. 2. Cut two lines of conductive thread, each one about 20 cm in length. 3. Thread the conductive thread through one of the battery holder diodes (there are small holes at each end). Tie a knot to connect the thread to the diode. Important: Leave enough conductive thread trailing from the diode for sewing. 3. Thread a second piece of conductive thread through the other end of the diode on the battery holder. Tie a second knot. 4. Puncture the felt with the ends of the LED light. The light bulb will be on the outside of the badge. The two ends of the LED will be on the inside of the badge, attached with conductive thread to the battery holder. 5. Once punctured through the felt, bend the ends of the LED so that they’re flat against the felt — you’ll have to bend them down too so that they don’t stick out the sides of your badge. They’ll make a “u” shape. 6. Before you sew, check to make sure the positive end of the battery holder is connected to the positive end of the light; the negative to negative. Test this by seeing if your light illuminates when you touch the ends to the trails of conductive thread. If it doesn’t work, switch the thread. Remember which way this worked so that you sew the correct thread to the correct end of the light. 7. Position your Battery Holder below the ends of the LED light so that you can sew the conductive thread through the felt and around the ends of the LED light. You only have one strand of thread for each end. Threading the needle with the conductive thread can be a bit tricky…but don’t lose patience! 8. Once you have both ends of your LED light sewn into the felt with the conductive thread, you should have an electrical circuit and the light should be shining! 9. Put the back on your badge by sewing it together with the other felt square using the regular white thread. The battery should be on the inside. The light will be on the outside. 10. Once you’ve sewn it, together, attach an MAET button under the light. Voilá! A felt badge that glows with an LED light! Remember that you’re making an electrical circuit. If bits of thread from one side of your circuit touch the other side, the circuit will short out and the light will not work. Trim the ends of the conductive thread before you seal up the backing. You don’t want the circuit to short out after all of your hard work!